This giveaway is now CLOSED. Congratulations to Amanda! To launch my brand-spanking-new blog, I’m hosting a GIVEAWAY! There is no kneading, no starter, no proofing yeast and no need for a bread machine. All you have to do is mix up a quick and simple dough, let it rise for a few hours at room temp, and then keep it in the fridge for up to two weeks. When you want to bake a loaf of bread, pull off a hunk from your big batch of dough in the fridge, shape into a loaf, let it rise for 40 minutes or so and then bake for 30 minutes! It really is THAT quick and easy to have freshly baked bread every day if you want it! 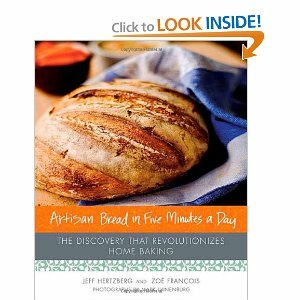 The book has helpful tips and hints that are easy to follow to produce the highest quality loaf, and is FULL different ways to use their basic recipe and other recipes, including Challah, Rye breads, pizza doughs, and even cinnamon rolls! The authors also have a wonderfully informative website. 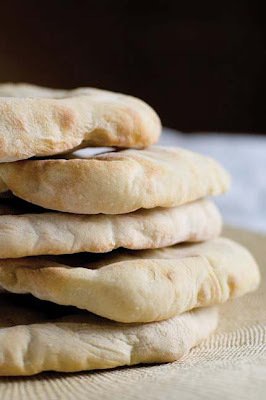 My husband has been asking me to make him some pita bread ever since we got married 3 years ago! (And I, *blush,* still haven’t done it!) Now I have a super easy way to do it…I could literally make it for him every day. He wouldn’t complain. This really is the easiest, fastest way I have ever seen to make so many delicious kinds of bread! This book honestly makes me happy…and now I want to spread the love and give one lucky reader their own brand new copy! Follow the brand-new Mama Chocolate blog! That’s a total of 9 possible entries! The giveaway will end on August 18th at 11:59pm, PST. The winner will be chosen via random.org and will be notified via email as well as announced on Mama Chocolate. The winner will have 48 hours to claim their prize or an alternate winner will be chosen. This giveaway is only open to residents of the US. I'd love to enter!! con [dot] brillante [at] gmail [dot] com. And yes, I am a resident of the US. My favorite cookbooks would be the Company's Coming series, a Canadian cooking icon. There are over 100 cookbooks, each with its own theme, from jam to seafood to breakfast. I'd like to enter as well. What a GREAT page! When I saw "chocolate" in the title, I just HAD to come see. Congratulations, Johanna! My email is douglassmom709 @ yahoo dot com. Expect to see more entries from me. Entry #3 – "Like" on FaceBook! douglassmom709 at yahoo dot com. entry #4 – post on facebook! Oooh, yay! A public blog AND a giveaway! It's almost too much…. So anyways, my email is stoosgirl at jslink dot net. I've been really curious about this book ever since Sara extolled it's wonders to me in April. Yay!! This giveaway made me so excited!!! I am following your new blog! I love the cookbooks "Taste of Home Comtest winning annual Recipes" I have the 2008 one and I love it! I also like the Sue Greg cookbooks for healthier eating! I now 'like' Mama Chocolate on facebook! I posted about your giveaway on facebook! Thanks for the great giveaway! I love the new blog too! Hello! I'm your newest follower from Friendly Friday. Hope you have a great weekend! I am here from Friendly Friday, but am happy to enter this giveaway since following is the mandatory entry. I usually don't ask for a follow-back on giveaways, but if you want to, please come to http://cakeblast.com. I love homemade bread, and bake more often than my wife. I love her recipes and her blog. Hard to pick one cookbook…but I do love my old version (1980s) of Better Homes and Gardens, and my even older 1941 "American Woman's Cook Book" ed by Ruth Berolzheimer. My most used is probably by Americas test kitchen cook books. I follow your blog from Green Follow Friday! This looks like a wonderful giveaway! When I was a kid we had a Kids Cookbook, for the life of me I cannot remember the name, but even as an adult I loved that cookbook! I also really love my Church's yearly cookbook that they release. It's full of yummy family recipes! Following you from Friendly Friday! "the simple, and yet incredibly complicated life of a stay-at-home mama and rejoicing in God's abundant grace every day!" (quote from your 'about me' is such a wonderful description! I'm on your page. Can't wait to see more! Following blog on google friend connect. A favorite cookbook is "Girlfriends on the Go." It's a cookbook for freezer cooking. Like Mama Chocolate on facebook. Following Mama Chocolate on twitter. Hi Johanna, good luck on the new blog (and I love the layout!) My email is amanda at exodusbooks dot com. Posted about it on Facebook. My favorite cookbook is definitely America's Test Kitchen's. It's my go-to if I need to find out anything about a recipe or type of cooking or if I need to know how to slice a roast. I love their writing style and the detail they employ in their descriptions of the testing process and I love they that want what's best, not what's cheap or healthy. That way if I want to be cheaper or healthier I can change it, but I know I'm starting from something delicious. Then there's my mom's cooking site: http://www.karenscookbook.com. This is mostly the food I grew up eating and I still often cook like this. I'm going to be working with her to create a new look and an easier way for her to manage content so that it will be more up-to-date and she can add all the new recipes she's developing! Does that count for two entries? Hi I am a new follower. I am following from Friday Blog Hop. I am a stay at home mom to 3 little ones (plus my older ones) Nice to meet you and thanks for the opportunity to win this book. Sounds great! We love homemade bread, but with my skin problems kneading is a problem. So this sounds great. my favorite recipe website is allrecipes.com . I love this site because it has so many great recipes, with lots of people who comment with variations and advice! Heyyy girl I loove the blog!! Great job!! Don't forget to link up friday!! I have been wanting that book for ages! My email is pheasanthillfarmgirl at gmail dot com. Hi! Thanks for following. I'm now your newest follower!!! I got a new cookbook this spring called "The Amish Cook at Home" by Lovina Eicher It has some great homey recipes for FAMILIES. I find a lot of recipes I like you have to double or triple to make enough for dinner for a family of 6 or more. This cookbook has great pictures and some really interesting stories and history of the Amish and their lifestyle. I have to go with Epicurious.com as a favorite cooking site…not very original, but still a standby when looking for a good recipe! Hi, Thank-you for following my blog, I am now following you back. New follower from admirer monday! Great cookbook. I'm your newest follower. I'm a new follower and can't wait to read your blog posts! My favorite cookbook, is over a hundred years old. It has some original recipes from Boston. They always come out great. My favorite baking site is joyofbaking.com. America's Test Kitchen Family Cookbook! I also like More With Less Cookbook. I don't agree with all their ideas, but they have great recipes that are easy! Hmmm…. I would say my favorite cookbook is nourishing traditions! They have so many good recipes. My favorite cookbook is actually Simple and Delicious Magazine put out by Taste of HOme! I have wanted this book for quite some time! I *LIKE* you on FB! You are on my blog! I put you on FB !! WHEW!! I'm done! Thank you for the opportunity to win this book! Love the idea of this book! My go-to cook book is anything by Cooks Illustrated or the America's Test Kitchen people. Never steered me wrong yet! Hey there! I'm your newest GFC follower from Green Follow Friday! I recently found ameliefille.blogspot.com and love trying out her recipes! My go to cookbook is actually one i made with cutouts from cooking light and recipes i've gotten off of myrecipes.com and allrecipes.com! I liked your blog on FB. I've posted about your giveaway on FB. I liked Mama Chocolate on Facebook. My favorite cookbook is a collection of xeroxed and e-mailed recipes from my family and friends in a 3-ring binder and plastic sleeves that I made myself. I have "store bought" cookbooks too. I posted about this give away on Facebook. Thanks for linkying up again! i follow the new mama chocolate blog. I love my 101 More Things to do With a Slowcooker! I "like" Mama Chocolate on FB! OMG that looks so yummy! My favorite cookbook is Shirley O. Corriher's Cookwise – so educational! Hi! Thanks for entering my giveaway. I'm now following your blog. I "liked" your Facebook page. My favorite cooking website is tastofhome.com. Oh I'm sorry, I didn't leave you a link to my post. Here it is. Just wondering if http://www.allrecipes.com is considered a cooking site. Because that is my favorite site for recipes and advice. I follow by google connect.